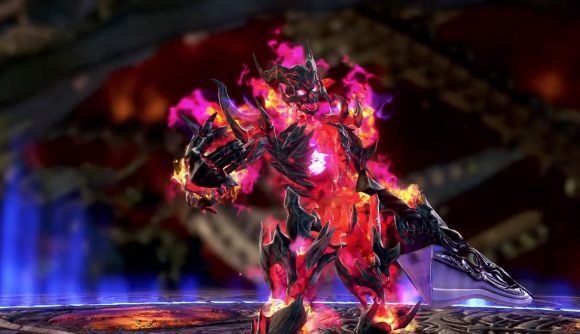 Soulcalibur VI skews toward the characters of the earliest games in the series, and today Bandai Namco has confirmed that Inferno, the original boss character, will join the character list. In keeping with those old appearances, he’ll take moves from all over the rest of the roster and outpower every other character – which is why he can’t be used online. Inferno dates back to the original game, Soul Edge (Soul Blade in the West), where he shared a name with the titular demonic blade. The Inferno name was coined in the first Soulcalibur, and it’s been with him ever since – though he hasn’t officially appeared since 3. He’s a move thief, taking on the fighting styles of other characters and swapping between them at will. Based on the reveal trailer below, Inferno looks to have a more unique fighting style this time around, though it appears to be largely based on moves from Nightmare. Either way, he’s a properly cheap boss character, and the trailer confirms he can’t be used online. Reports from early builds of the game suggest he’s the final boss of Soul Chronicle, and will be unlocked by progressing through that mode. Check that power out in action below. Soulcalibur VI is due to release in just a few weeks on October 18, simultaneously across consoles and PC in a first for the series.